Last week I paid another visit to the beautiful coast of Dorset, around the Swanage area, as it had been a while since I'd been there last, which meant it high was time I got a few more pictures from this very scenic region. My first day was spent almost exclusively at Durdle Door and Corfe Castle, or Durdle Dorf Castle as I like to say when referring to them together. My initial stop was sunrise at Corfe Castle, where I ascended West Hill, to get a view of the sun rising from behind the ruins. Unfortunately the sky wasn’t looking like it was going to play ball, there were hardly any clouds, apart from a thick plume along the horizon where the sun was supposed to make an appearance. So I was not best pleased I can tell you, but as I’d made the effort to get part way up the hill, I wasn’t about to turn back without giving the dawn the benefit of the doubt, and allowing it to make amends for such a tardy display. There was at least, a smidgen of interest in the sky after a while. I’ll give it its due, in so much as it made a bit of an effort, but it was hardly an accomplished achievement. All the same, I took the swooping line of clouds hovering above the castle and made what I could of them. They soon started to scatter and disseminate into corrugated bands, catching the creamy light on their flanks, as they slowly dispersed. The appearance of the sun improved things nicely. Thankfully the rampart of clouds on the horizon had taken their leave, and the sun rose unhampered into the sky, casting a flavescent light onto the side of the hill, which gave the scene a much more pleasing atmosphere. The clouds never did get their act together though, and I made it very clear I was expecting better things from them over the next couple of days, which in hindsight was a grave mistake. Never piss off the clouds. Never. I wanted the castle to cover the empty looking field to its left, but I just couldn't get the position. After returning to the house for some breakfast, I headed into Swanage for a coffee and a wander around town. I had a walk along the new pier with the notion of getting a customary shot of the remains of the old pier, but thanks to the dive float that was now surrounding one end, and the extensive works they were doing to build a new lifeboat station a few hundred yards away, the scene was a complete mess. So with fury in my heart, and issuing spasmodic mutterings about letting people drown if they’re foolish enough to enter the abyssal doom that is the ocean, I made my way back to car. I’m just kidding of course, a life boat station is very important, and the volunteers that man the boats are heroes, but I’m just saying, anyone who freely and intentionally spends time in the watery holocaust that is the sea, should be prepared for, and amenable to, desolate ruination. 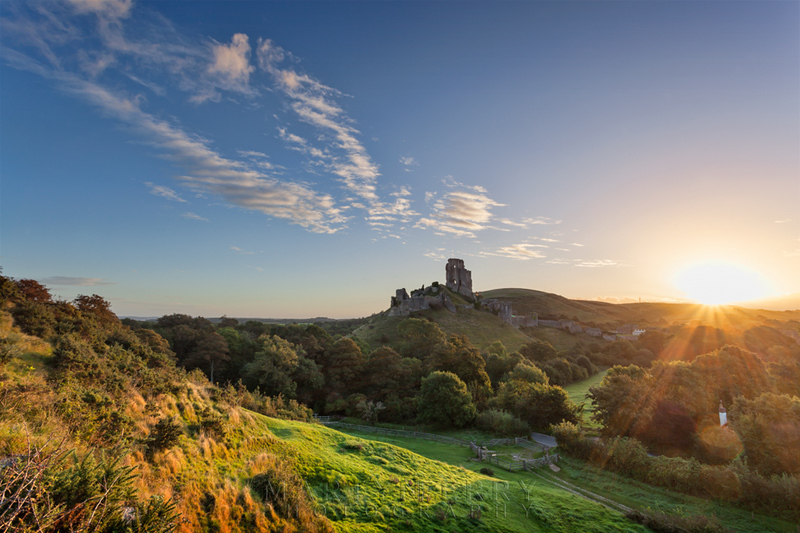 I then returned to Corfe, this time scaling East Hill, to get a view of the castle from the other side. The clouds by now had gathered in some plenitude, and my task was to try and get a shot of the ruins. Lit up in the intermittent late morning sun, as it tried to navigate its way between the ever shifting clouds, while they twisted and billowed in the strapping wind. I walked this way and that, up, down, all around, looping the loop and defying the ground, to try and find a composition that would fit the castle into the landscape in a satisfying way, but in the end I had to concede I just couldn’t get the shot I wanted. So I settled for what I could get before trundling back down the hill and fetching myself, what turned out to be, one of the best, if not the best, Cornish pasty I’ve ever had. A closer view of the scenic ruins. I then took a trip to Old Harry Rocks, three large chalk formations that jut out of the ocean and mark the most easterly point of the Jurassic Coast. On paper, they should make for an interesting picture, but I've never been able do much with them, they're too stark and bland in the daylight. Probably better for a sunrise image, but it’s about a mile walk to get to them, and a rather dull mile at that, and being the lazy sod that I am, I've never been so inclined. There are various stories about the naming of the rocks. One legend says that the Devil, traditionally known euphemistically as ‘Old Harry’, had a kip on the rocks. And that is about all you need to know about Old Harry Rocks, as I didn’t get any pictures, you can happily never trouble yourself with their existence again. My final stop of the day was a leap along the coast to Durdle Door for sunset. When I arrived it was looking decidedly grey, and it wasn’t long before that grey became, well, greyer. And as has happened so many times before, I spent some time sitting in the car, watching the rain seethe and splatter against the windscreen, as if it had a personal vendetta against me, and I wondered what I had done to vex it so thoroughly. Evening sun lights up one side of the cliffs overlooking Man O'War Bay. I wasn’t too disheartened though, I could see from the patchwork of peppery shades above that, with luck, it would move on and vent its imprudent acrimony upon another unfortunate character. And move on it did, so once that had been taken care of, I gambolled down the steps to the viewpoint that would give me access to both Man O’War Bay and the mighty Door itself, and got myself in place for what I hoped would be a worthwhile sunset. Looking over Man O’War bay, I waited for the sun to descend from beneath its pearly cloak and light up the cliffs that overlook the clam shell shaped bay, which after a while it duly did, and it wasn’t long before they started to glow an amber hue. I then moved across to take in the view of Durdle Door itself. This time of the year, it doesn’t catch much evening sunlight, thanks to the position of the setting sun, but it wasn’t long before the clouds, as they sailed smoothly across the vista, began to gently pulse with colour. Panorama of Durdle Door in the evening light. I spent the next hour or so watching the glow of the waning sun, as it abandoned the scene in front of me for pastures new, leaving behind a picturesque cloudscape, while the ocean below glimmered in the encroaching twilight. Once the sky had been drained of colour I took my leave and drove to Swanage, where I had a rather good meal at the Black Swan. A final shot of this beautiful stretch of coastline under some pastel clouds.